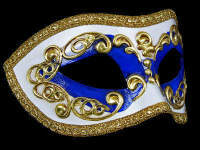 Antique white & gold painted base with sheet music detailing.......Stunning Venetian masquerade mask. The epitome of understated glamour, this stunning Musica masquerade mask will introduce you to classic design that never fails to make a striking party impact. Inspired by Venetian tradition, this eye-catching piece features a wonderful antique white painted base with glittering gold detailing. 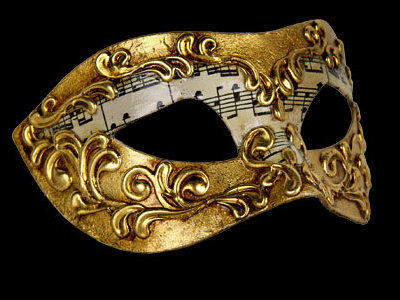 The addition of the sheet music adds yet another dimension to this stunning mask demonstrating that timeless design never loses its ability to turn heads wherever you go. 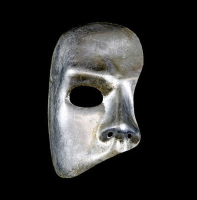 With black ties this mask is perfect for your next masquerade party, wedding, prom night or Venetian masked ball for a man or wowan to wear. 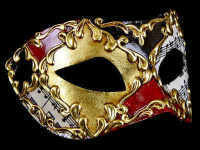 All Venetian masquerade masks are handcrafted and in Venice & shipped to the UK by Simply Masquerade just for you.